Stewardship and enhancement of our environmental assets are long standing priorities in the City of Westlake Village and will always remain so. "Going Green" has become so widely popular it seems everybody is doing it these days. The City's "Green Page" contains information for residents on conservation, rebates, and other environmental tips as well as environmental programs the City participates in. Often times our partners such as the Water District or Southern California Edison announce workshops or rebates. Check this page for upcoming opportunities or sign up under "Notify Me" to receive environmental program announcements. Check you and your families Carbon Emissions on Our Carbon Calculator. 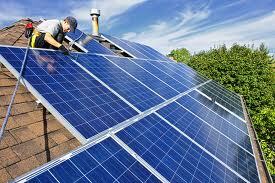 The way to get a solar system permitted in Westlake Village has a few steps. The first step after selecting the solar company that’s right for you, is to talk to your Home Owner’s Association, if you have one, to get approval. Once HOA approval is granted, bring one set of plans on 11x17 paper, a copy of the HOA approval, and either cash or check made payable to the “City of Westlake Village” in the amount of $50 into City Hall between the hours of 8 a.m. to 5 p.m. on Monday through Friday, and the Planning Department can issue City approval. Additionally, plans can be submitted digitally to the City via EMAIL. If submitting electronically, please include a digital copy of the HOA approval. We are unable to accept electronic payment, so electronically submitted solar plans will need to have a check for the $50 fee mailed to the City at the attention of the Planning Department. Please reference the project address on the check, and once all three items are received, an approval will be issued and returned electronically. The next step after gaining City Planning approval is to submit the approved plans to Los Angeles County Building and Safety to have permits issued. For questions regarding the City’s process, please call the Planning Department 818-706-1613 and for questions relating to the building permits, please call LA County Building and Safety at 818-880-4150. City residents are eligible to receive one free tumbler-type home composting container (actual composting tumbler may differ from the one pictured). Residents may request the tumbler by calling 805-522-9400. There is a $25 delivery fee. All Westlake Village residents are asked to do their part to help conserve water. For more information, visit the Las Virgenes Municipal Water District website. Since 2005, the City has been in the process of updating and improving its water conservation methods in street medians, parkways, and parks. These improvements have included planting draught tolerant landscaping, and the installation of a City-wide centrally controlled irrigation system that is weather-based controlled resulting in a significant reduction in water use. The Agoura Road medians are a great example of these types of improvements. In addition, the City only uses reclaimed water to irrigate public landscape area, greatly reducing the draw from precious drinking water resources. The City conducts surface water quality monitoring on a weekly basis to gather information to better protect our fragile ecosystems. The Three Springs Priority Catch Basin Retrofit Project which prevents debris and trash from entering the stormdrain system. The Westlake Lake, Phase I and Phase II Median Retrofit Project that reconstructed the center medians into bioswales for capture and infiltration of storm and urban run-off. City-wide Irrigation Control Retrofit Project which converted the City's conventional timer controlled irrigation system into weather-based SMART controller system which uses automation to reduce water demands and thereby reduces non-storm water run-off that is largely associated with urban pollution. A number of water quality improvements as part of the City Lindero Canyon Road Interchange Improvement Project and Westlake Village Community Park project. The City participates in environmental outreach efforts throughout the Malibu Creek Watershed that include beach clean-ups, Earth Day events, annual watershed tour, printed materials, and television and radio broadcasts that support Eco-friendly messages. All City vehicles are fuel efficient hybrids or CNG vehicles. City streets are swept weekly to reduce unwanted materials entering our storm drains. The City conducts weekly water quality monitoring tests to better protect our streams and creeks. Westlake Village tests have shown bacteria levels well below the state mandated levels. The City employs a synchronized traffic signal network thereby limiting emissions by minimizing congestion on major thoroughfares. The City has updated several in-house procedures to ban the use of polystyrene foam products at City Hall. The City is updating all of its medians, parkways and park irrigation system to use only weather-based controllers and water efficient sprinkler heads to control over irrigation and run-off. The City operates Westlake Village Transit which helps to deliver hundreds of kids to school and reduce traffic congestion in and around our neighborhood schools. The City provides household hazardous waste and e-waste recycling curb-side pick-up. The City’s annual street resurfacing project recycles and uses approximately 20,000 waste tires per year on average. That equates to about 2.2 tires per City resident. The City’s traffic signals and safety lights use LED lights as a means of reducing energy costs. Through an extensive recycling program, the City has diverted 62% of the City’s waste from the landfill, exceeding the state’s 50% waste diversion goal by 12%.